IMBB #15: Has My Blog Jelled? When Elise, from Simply Recipes announced this month’s IMBB (Is My Blog Burning) topic I knew immediately what I wanted to do. Her primary goal was recipes that used gelatin of some sort, but she graciously extended the topic to include all things jelled, which included JELLIES and that’s when my plan popped into my head. I have, in the past, made wine jelly but it has been quite some time. A couple months ago I started thinking that I should make a batch or two and add elements that had not been included the last time I’d made wine jelly. And so I prepared to enter my first IMBB, the grandfather of all Food Blog events. 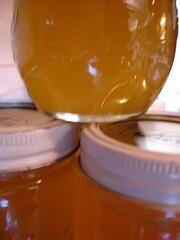 My goal was to make not just a plain wine jelly, but one that incorporated herbs and savory flavors. I wanted something that could be used both as a simple addition to creamy cheese on crackers or bread and do double duty as a glaze or simple, light sauce on meat or fish. I looked at my old recipes and checked out a few online. I found this Rosemary Mint Wine Jelly, which was close to what I had in mind. I actually wanted something with more rosemary, less mint and some garlic but I thought I’d adjust the ingredients a bit and I’d be in good shape. I used a chardonnay wine – nothing fancy but a decent wine. I used 1 cup of rosemary, 1 cup of mint and two large garlic cloves but kept the other ingredients the same. 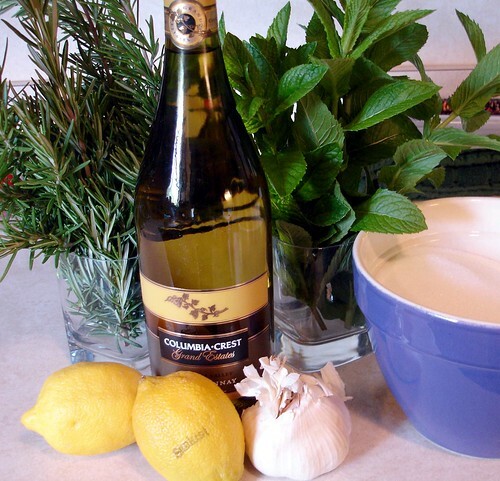 I found though, that when I strained the herbs after steeping them in the wine, I had more liquid than anticipated. 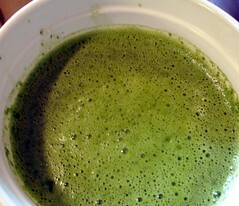 I still had two full cups and, so, couldn’t add lemon juice to bring it up to 2 cups. Instead, I decided to use the full amount of liquid plus the 1/4 cup of lemon juice, although I was a bit worried it might not set completely. Also, the recipe suggests using the water bath method to ensure the jars are properly sealed. I’ve been making jams and jellies for years and have never found that a water bath is needed for them. (I do use it for other foods, however.) If you keep your jars and lids hot, work quickly and makes sure you haven’t spilled any stray drops of jam on the jar rims, the jars should seal without a water bath. I keep my jars in a 200° F oven and just pull two out at a time to fill them. I also pour boiling water over the lids and then remove them from the water as I need them. A couple hours after filling the jars, you can check to see if they have sealed by tapping them. If the sound is solid, they have sealed. If it sounds hollow they have not, or if the lid is springy at all, they have not. In that case, you can either try sealing them again by reheating everything, and using a new lid or you can opt to keep the jar in the fridge, which will keep it from spoiling. The jelly did not quite turn out as I had imagined, although it is pretty good. It is more lemon-flavored than I had expected and it is also a little too sweet. I would add more rosemary and garlic and reduce the sugar a bit the next time I make it. To counteract the sweetness, for my sampling tonight, I mixed it with savory and spicy food. I used a sesame cracker for the base, which added a bit of nutty flavor. 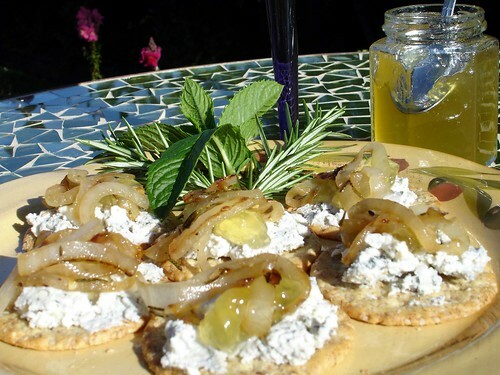 I topped that with a pungent, but crumbly bleu cheese that I’d mixed with a little fresh ricotta to make it more of a spread and stick to the cracker. Next came a little dollop of the jelly. It was all topped with onions caramelized in butter and olive oil, flavored with one dried cayenne pepper, chopped rosemary, salt and black pepper. I nibbled these while sipping the remaining wine from the bottle and overall it was quite a lovely snack! Of course, it also helped that the thunderstorms from earlier today had cleared, the sun was out and once again I was able to sit in the sun on the deck while enjoying my treat – everything always tastes better in the warm, spring sunshine! Even though this recipe did not come out quite as expected, I think it’s a good base to play with. And actually, it will make a good glaze for chicken, pork and even some fish, like halibut. Next I may try using a Rosé or a Red and complementary herbs to see what delicious combinations I can discover! Hi Brenda – I love both rosemary and mint with lamb. Do you think this jelly would go well with lamb?